Background Gradient is a widely used design technique that is available as a function of CSS, meaning that Gradient can be applied as code rather than a static background image. As such, MOBLE allows you to create linear gradients right in Frame Tools without requiring a line a code. Your website has sixteen overlay colour options in total. These are controlled in the Colours tab of the Styles area. You can control the angle of the linear gradient simply by moving the slider to rotate the angle. How to add a 'Background Image' to Frames on my website pages. How to control the 'Background Image Position' on both mobile and desktop. What is 'Background Image Fit' and what are the nuances of being a content master. What is 'Background Image Repeat', when would I use this? 'Background Image Fixed' can make you a seriously great website designer, with ease. 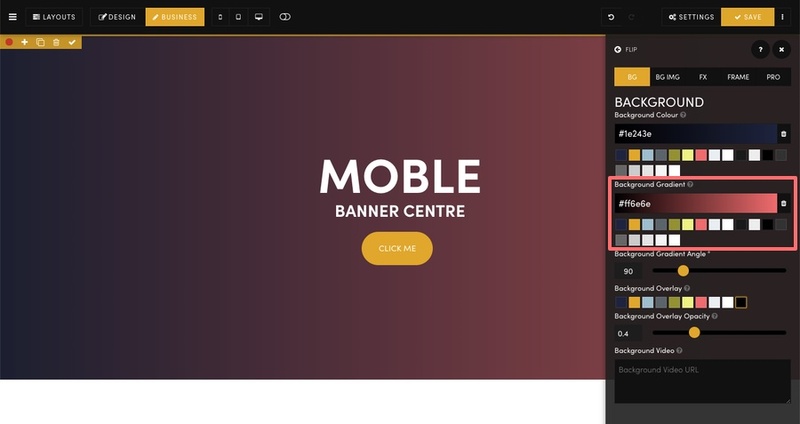 Set the 'Background Colour' of any part of your website pages. 'Background Overlay' is a superb feature, allowing text to be read on top of your images. How to use 'Background Height' for background images and backgroud colour. How to add a 'Background Video' to your website pages.